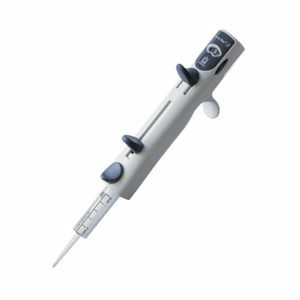 Product and ordering information for the Transferpette® electronic pipette. 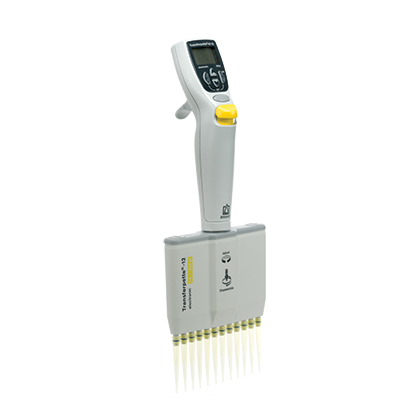 Accurate, ergonomic single and multichannel electronic pipettes for use in most laboratory applications. 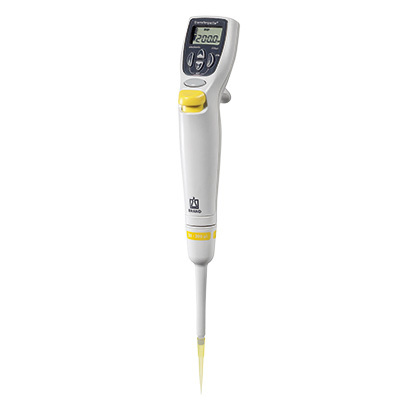 Transferpette® electronic single channel pipettes are supplied with battery, 120V AC adapter with charging cable ("with AC" models only), one pipette tip sample pack, silicone oil, operating manual, and one year warranty. Transferpette® electronic multichannel pipettes are also supplied with pipette stand, one TipBox and TipRefill (in place of tip sample pack), reagent reservoir, tip cone tool and set of replacement V-rings. 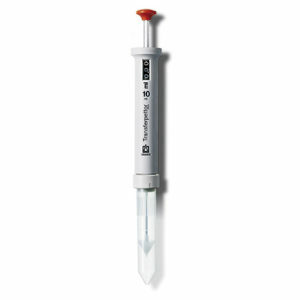 The tip cone on the Transferpette® electronic single channel pipette has a unique design that fits many brands of pipette tips. The multichannel Transferpette® electronic pipette has a V-ring design that also fits most major brands. However, because there are a large number of tip manufacturers, some of whom privately-label to distributors, it can be very hard to determine if a specific tip will fit properly. Also, some brands of pipette tips are made with poor quality control and materials, so the tips do not consistently fit. For non-BRAND tips, we suggest asking the manufacturer for samples. It should be noted that BRAND makes a very high quality tip, competitively priced, that will deliver the best performance for your BRAND pipette. BRAND's 5mL tips and the Finnpipette 5mL tips, and BRAND's 10mL tips and the Eppendorf 10mL tips, can fit on each other's pipettes. BRAND tips will also fit most Gilson, Rainin, Eppendorf and Finnpipettes, but tip fit should always be tested as pipette manufacturers periodically make product modifications that can impact tip fit. When switching brands/pipettes it may be necessary to recalibrate the instrument. It depends. We recommend that the Transferpette® be calibrated at least every year. However, as part of any continuous quality assurance process, if the instrument requires significant adjustment, the interval should be shortened. Why are the ejector caps different colors? The colors of the ejector caps indicate which tips fit on the pipette. The colors are: Light gray - ultra-micro tips; Yellow - 200µL tips; Green - 300µL tips; Dark gray - 1,000µL tips; Red - 5mL tips. Are the manifolds interchangeable between the electronic multichannels and the mechanical multichannels? Are the 8-channel manifolds interchangeable with the 12-channel manifolds. As long as you stay with instruments of the same volume range, yes. However, the accuracy of the instrument should be confirmed after interchanging the manifold. Are the individually replaceable tip cones on the electronic multichannels interchangeable with the ones on the mechanical instruments? What does "Certified Ergonomic" mean? Ergonomics Approved: The Transferpette® electronic received TÜV's highest ever ergonomics rating - higher even than any consumer item they had ever tested. User Friendly: This certification reflects the ease of use of the instrument - that it's possible for many users to pick the instrument up, and begin to use it without reading the manual, and that the manual itself contains clear, concise, easy to understand directions. User Tested: This certifies that testing was performed by real-world users, and not just in the TÜV laboratory. What does "Blo" mean on my pipette? It doesn't stand for "Battery Low". 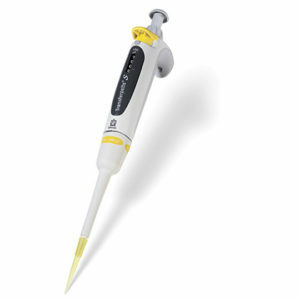 It indicates that the instrument needs to be blown out (by pushing the pipetting button), prior to it being used. Battery life is indicated by battery-shaped icon on the display. What does the "rEF" stand for on the faceplate of the instrument? "Reference movement". When the lower section of the instrument is removed and reattached, the instrument must have a reference movement performed, to align all of the pipette parts. To perform this task, press the "Menu" and "Enter" keys simultaneously. "rEF" will appear on the screen. Then press the pipetting button. The instrument will perform the reference movement. The instrument will be slightly louder, and vibrate slightly more during the reference movement than during regular pipetting operations. A "lambda" (λ) is sometimes used as a shorthand for a microliter (µL). They are the same thing. 1,000 µL = 1,000 λ = 1 mL. SOP's are available right on this website (see links below). Additionally, all of the SOP's for BRAND's liquid handling instruments, as well as the BLAUBRAND volumetric glassware, are compiled in EASYCAL™ 4.0 for easy reference. Note: The handle is not autoclavable. Pipette Stands and Shelf mounts - Bench-top and wall/shelf mounts for convenient storage of pipettes. Autoclavable Reagent Reservoirs - Manufactured from polypropylene, these 60mL reservoirs come with lids, and are available non-sterile or sterile. Batteries and Chargers - Replacement batteries and AC chargers are available for the Transferpette® electronic. Filters - Replacement filters for 5mL single channel pipette. Spare Parts - A full listing of spare parts can be found in the operating manual provided with the instrument. For assistance, contact BrandTech® Customer Service.